Do you know how in some communities most of the automobile dealerships tend to be located in one area? It makes it convenient for shoppers to hit a lot of new car showrooms and used car lots without having to drive all around town. We have a similar setup with pizzerias in the La Quinta–Palm Desert area. A person could sample good pizza at a different restaurant every day for more than a week without ever having to leave a short stretch of El Paseo, which is the business section of Highway 111. Your trek might start at the Haus of Pizza (72795 Hwy 111) then ramble down the road to Stuft Pizza (72840 Hwy 111). Next up could be Sammy’s Woodfired Pizza and Grill (73595 El Paseo) or the Copper Oven (73196 Hwy 111) followed by The Hood Bar and Pizzeria (74360 Hwy 111) or perhaps Piero’s PizzaVino (73722 El Paseo). Let a thousand pizza styles bloom! Are you getting the picture? I don’t know exactly how this incredible concentration of quality pizzerias occurred, but – like any true pizza connoisseur – I’m glad it did. Talk to locals and you’ll find folks who swear by their favorite among this lineup and I think that demonstrates that no matter how you prefer your pizza, you’re going to find a great restaurant offering your favorite style. Many of us love the food at Stuft Pizza. They have a wonderful wood-fired oven that makes their hand-tossed crust something very special. And, like many of the restaurants listed above, their offerings go far beyond pizzas and include pasta, steak, seafood, sandwiches and more. They also feature a very long wine list and impressive selection of craft beers. There is also a Stuft Pizza in La Quinta, which is so popular that it is always busy, no matter what time of year! You’ll need to go on your own pizza adventure to see which aligns best to your tastes. But lest you put on a few pounds while you’re conducting your research, there are some good ways to work off those calories right in the area. Cahuilla Hills Park is nearby and that’s where you’ll find the trailhead for the Cahuilla Hills trail system. It also has a tennis court and four pickleball courts, a sport that is rapidly growing in popularity. Golf is great exercise too! And if you want to burn some calories on the golf course, La Quinta Country Club and La Quinta Resort are not too far from the “pizza district.” And that brings up another fact: the concentration of great pizza restaurants in La Quinta, Palm Desert, Indian Wells and the Palm Springs area in general may only be topped by the concentration of great golf courses here. To pinpoint the exact location of golf courses and many of the areas best restaurants, be sure to download our Golf Resource Guide. It’s a free guide and it gives you a bird’s eye overview of almost the entire Coachella Valley. For example, if you want to see the location of golf course properties in and around courses such as the Citrus Club, The Palms Golf Club, Silver Rock Golf Resort, Painted Cove and many more, this is the guide you need to see. And when it’s time to take your search for the ideal home to the next level, just give us a call or drop us an email so we can help out. Here’s to your enjoyment of desert living, golf…and pizza! Two Great Dining Opportunities in La Quinta! I think a lot of residents here in La Quinta and the nearby communities share the sentiment Arnold Palmer expresses in that quote, but I know that the golfing legend appreciates more than a well hit drive. I say that because I’ve dined at his restaurant, Arnold Palmer’s. As we’re into the holiday season, food, feasts and festivities are big on everyone’s mind…and schedules. I’m certain that many of you are looking forward to preparing some major meals when you host family and friends in your homes. But let me urge you to take it easy on yourself every so often and enjoy a great meal in a top quality restaurant. If you’re in La Quinta, or planning to come through the area, make sure you put a stop at Arnold Palmer’s on your “to-do” list. And if the golfers in your group want to go on an Arnold Palmer Pilgrimage, they can play a round at the SilverRock Resort’s Arnold Palmer Classic Course and then end the day enjoying dinner at The King’s restaurant in La Quinta. Not only does the restaurant serve great food, the photos and trophies on display make it a very tasteful homage to this special man. That’s just one of the options here. I’m planning on highlighting a few more of our popular restaurants in coming weeks, but before I leave the topic in this missive, let me give you another suggestion: Morgan’s in the Desert. This is another very highly rated restaurant and it’s also a good one if your party wants to blend golf with fine dining. Morgan’s is at La Quinta Resort and Club, so it’s an ideal place to meet up after an afternoon round of golf. One thing I really appreciate about Morgan’s is that they always have some seasonal event or feature going on. For instance, in November the restaurant will be doing a “Duck and Pear Festival” followed by a “Alba White Truffle Festival” in December. This keeps the menu fresh so even locals can go back again and again and find something new to try. 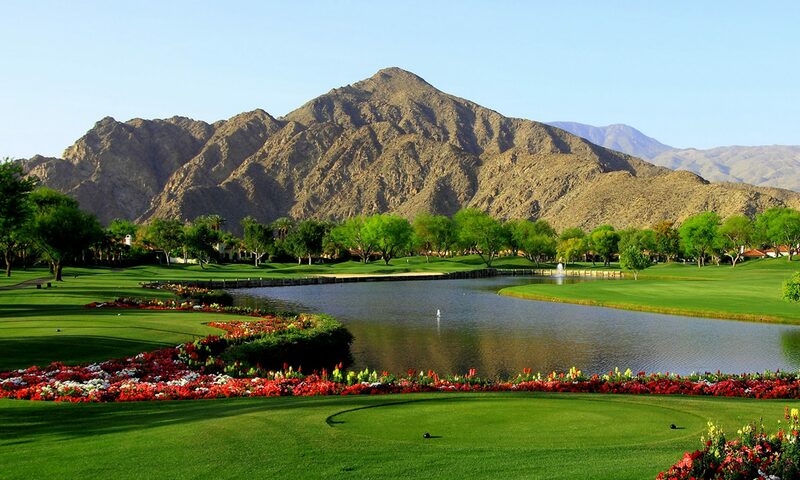 And with so many great – and world famous – golf courses in our area, whenever you’re looking for a fresh links challenge, La Quinta, Palm Springs and the Coachella valley can serve one up. If you want to see how all of these golf courses and restaurants relate to each other in terms of their locations, we have exactly what you need: our guide to La Quinta area golf courses and restaurants. It’s a free download and it will show you exactly, for example, how close Arnold Palmer’s is to The Citrus, La Quinta Resort, La Quinta Country Club and The Tradition. And to take this one step further – you can also own a great home on or near those courses. Our golf course guide will also help you find the areas where you would like to own property. With all of this said, let me make one prediction: You’ll soon be on the phone making tee time and dinner time reservations. A Slice of San Antonio Coming to La Quinta? It’s exciting to live in a community where things are happening and that’s the way it feels right now in La Quinta. It was recently announced that plans for the SilverRock Resort could include a river walk lined with excellent restaurants and retail establishments, similar to the River Walk in San Antonio, Texas. Developers presented their ideas to the city council here and the public got a chance to see what changes are in store for the home of the Arnold Palmer Classic Course at Silver Rock, which was the site of the Bob Hope Classic from 2008-2011. Locals were pleased to see how the changes are being planned not only for the benefit of visitors, but for local residents as well. I mentioned the river walk above, but that’s just part of the trail system envisioned for the 500-plus acre property. People will be able to walk or ride bikes all throughout the area. Along with developing the natural aspects of the property, the plans include a second luxury hotel, a conference center, homes, luxury camping facilities, gardens, recreational water activities and much more. Centered around the Arnold Palmer Classic Course, the project is being developed around a really strong core. The course was in Golf Magazine’s “Top 10 New Golf Courses You Can Play in America” in 2005 and is a consistent award winner, including Zagat America’s “Top Golf Courses Award” three times…so far. When you download our free golf resource guide, you’ll see that it serves as a Palm Spring country club membership guide by detailing fees and additional information. You’ll find SilverRock in a kind of circle of great La Quinta courses that includes The Tradition, La Quinta Resort, the Citrus and Rancho La Quinta. You’ll also see that this area is blessed with many great restaurants. Residents certainly don’t waste a lot of time in their vehicles when they live in La Quinta. The same is true for Indian Wells and Palm Springs real estate in general. The good news is that you don’t have to wait to play the Arnold Palmer Classic Course. It’s open to the public and in beautiful shape right now. Just call for a tee time. In the same way, there are fantastic homes available in the area right now as well. Use the search feature on our site to begin your hunt. You can enter all kinds of search terms, such as the name of the golf course or community you’re most interested in. Try terms like Mountain View Country Club, PGA West, Rancho La Quinta, The Citrus Club, The Hideaway, The Tradition or others to get some good ideas. When you need more information, we’re ready to help out. We can answer your questions, offer insights that you can’t get with online searches and get you out to see some properties. Give us a call and share in the excitement! Okay, what am I describing with that? If you guessed wine, you’re mostly right. If you guess coffee you’re mostly right too. Really, I just randomly picked some words and phrases commonly used to describe both drinks and it turns out there’s quite a lot of overlap in the terminology connoisseurs use describe wine and coffee. I go to Crema.co, to get my coffee delivered to me weekly. I love their service and have yet to be disappointed. We’ve discussed food in La Quinta and the greater Coachella Valley here before and when you download our golf resource guide, you’ll quickly notice that it’s also a good guide to local restaurants. I want to go back to that topic today, but with a twist; we’re going to look at two very interesting and top quality establishments, one that is noted for its wines and the other for its coffee beverages. If you have a serious interest in wines, you’re probably familiar with the Wine Spectator. It seems to be the semi-official arbiter for anything having to do with wines, at least in the United States. The magazine has once again given Morgan’s in The Desert its “Restaurant Wine List Award of Excellence.” The restaurant is located at La Quinta Resort and Club. The award recognizes how Chef Jimmy Schmidt is able to offer wines that pair beautifully with his creations as well as satisfy a wide variety of wine lovers. If you follow the restaurant throughout the year, you’ll see that Chef Schmidt often pursues seasonal themes that highlight the restaurant’s 3,000-bottle wine collection. And speaking of exceptional drinks, let’s turn our attention to a new coffee drink that you can enjoy at Juicy Juicy in Bermuda Dunes: “bulletproof coffee.” It’s becoming popular for its incredibly smooth texture and perceived health benefits – however, be warned, this is not a low-calorie drink. The three basic ingredients are premium coffee (two cups) made from freshly ground beans, butter from grass-fed cows (2 tablespoons or more), and a top-quality oil such as coconut or MCT (1-2 tablespoons). It’s all tossed in a blender and whirled it until it gets frothy and smooth. Why butter from grass-fed cows? Unlike butter from grain-fed cows, grass-fed cows produce butter rich in omega-3, which our bodies need. “Your body runs off of that omega-3 oil throughout the day, and when that energy runs out, it’s just your own energy kicking in,” Juicy Juicy owner Karen Levreri recently explained to the Desert Sun. Now that we’re all craving something to drink, let me suggest this: the next time you visit the desert looking at real estate in La Quinta, Indian Wells or the general Palm Springs area, treat yourself to at least one “bulletproof coffee” to keep you going strong throughout the day and then enjoy a relaxing meal with a great bottle of wine at Morgan’s in The Desert in the evening. It’s the perfect way to end a day of real estate shopping or golfing at La Quinta Resort, or any of the other courses in our area, don’t you think? One final word: Don’t forget to press the button at the bottom of the page to get your free Palm Springs golf guide. It has the courses all mapped out and even gives you the information you need for Palm Springs country club memberships. It doesn’t seem that long ago when the majority of restaurants served “American Cuisine.” It might be a little hard to define, but if you’re like me, you know it when you see it. Today, folks who pay any attention to diet and nutrition trends in our country knows that there are many streams in contemporary eating, nutrition and restauranteering, and no matter what dietary road you’re traveling, you’ll be able to find great food in the Coachella Valley whenever you decide it’s time to eat out. I suspect that this is true because of our intimate connection with Southern California’s trend setters. If it’s popular in Hollywood or Beverley Hills, it’s going to make its way to Palm Springs, La Quinta, Indian Wells and the greater desert area very quickly. Let’s visit some favorites. The menus in these restaurants aren’t always entirely reflective of the diets listed, but have enough excellent items to satisfy diners trying to stick to their preferred foods. The Paleo diet features foods that were available to our ancient ancestors and is rich in lean proteins – including grass-red meat; fruits; vegetables; fats from seeds, nuts and avocados; olive oil; and fish oil. Restaurants that meet the needs of this diet often have close relationships with local growers and ranchers. Some restaurants preferred by the Paleo crowd include, Workshop Kitchen + Bar, The Tropicale, Jiao and Birba, all in Palm Springs. La Quinta Souplantation and Zpizza are popular choices for vegan and vegetarian cuisine in La Quinta. Zpizza also caters to those sticking to a gluten-free diet. In Palm Springs, vegetarians and vegans enjoy the Palm Greens Cafe, Nature’s Health Food and Cafe, and Native Foods Cafe. Juices are a great choice for a meal or snack and there are lots of places in the Coachella Valley to quench your thirst and sate your appetite. The Fresh Juice Bar in Palm Desert always gets high marks. Also in Palm Desert is Luscious Lorraine’s Organic Juice & Food Bar. Vegetarians will also find a good menu at Lorraine’s. In La Quinta we really like Juice It Up! I apologize to the great places that I haven’t mentioned here. I just wanted to give readers a quick overview and perhaps a few places to visit when they come to look at property. Because the the compact size of our area, whether you buy La Quinta real estate, Indian Wells real estate or frankly real estate anywhere in the greater Palm Springs area, you’re going to be close to excellent eating, even if you’re trying to stick to a more specialized diet. This means you can enjoy an afternoon of golf on one of the courses at the La Quinta Resort, The Tradition Country Club La Quinta, PGA West La Quinta or at the Mountain View Country Club La Quinta for example and be only minutes away from meeting friends and family at a great local restaurant. To offer you a little extra help, if you download our free Palm Springs Golf Guide, you’ll find that we also give you the locations for many excellent local restaurants. Download it today and start planning your visit. Of course, we’re just a phone call away to answer any questions you have and fill you in on current real estate market offerings.